CALGARY - A yellowed letter that turned up in an antique trunk halfway around the world is giving people in a small Alberta town a glimpse at what post-war Prairie life was like nearly a century ago. 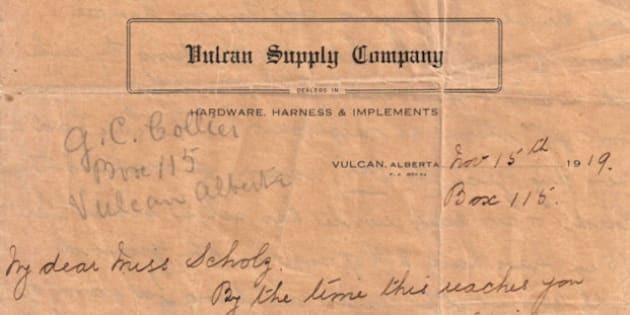 Violet Collier penned the correspondence on Nov. 15, 1919 — shortly after the First World War — on letterhead from the Vulcan Supply Co. in the town of Vulcan, southeast of Calgary. The letter remained hidden away in a traveller's trunk for 94 years until a man named Tim Lacey bought the trunk in Balaklava, Australia, a few years ago. When he finally got a chance to go through it, he found the letter, looked up Vulcan on the map and shipped the missive back. "It does not seem as though things will ever be the same again, since this war, everything here is upside down with strikes, the United States is in a dreadful state," the letter reads. "Serves them right though they are always saying 'How they won the war,' running down other 'Nations,' thinking they rule the world, you should feel thankful you have not got them as neighbours." Collier goes on about the weather at the time. "We have had a very dry year (the 3rd) again, it’s making things bad. An early winter has set in since October 15 we have had 2 feet of snow on the ground...cattle are dying for want of feed, hay is an awful price, can scarcely be got. Government is talking of helping out more than has been." The letter is addressed only to a Miss Scholz. The writer's grandson, Dave Collier, was a bit surprised at the tone of the letter, which he said shows a different side of his grandmother who died when he was 19. "The letter kind of seems out of character because she is so obviously respectful and likeful of this person she was writing to," said Collier, 70, who still lives in Vulcan. "She was very chatty and was not to my knowledge ... like that at all with any of us. She was a very nice lady but totally reserved. "I never had a real conversation with her about anything." Collier said his grandmother would have been in her late 20s when she wrote the letter. He said she was born in Tasmania and lost her parents when she was nine years old. She was taken in by other relatives and went to school in New Zealand, Australia and England. "This was a person she either went to school with or a relative she lived with — obviously somebody she had grown quite close to." Collier said his grandparents met briefly in England before his grandmother came to Canada in 1908 in what he suggested was probably an arranged marriage. It's believed the strike Collier was referring to included the six-week long Winnipeg General Strike of June 1919. She also recounted seeing the future King of England, Edward VIII, during his trip to Alberta in September 1919. King Edward would abdicate the throne when he married American divorcee Wallis Simpson. "We have had the 'Prince of Wales' out here, we drove 95 miles by auto to see him, had a dandy view, he is such a nice open faced boy everybody is in love with him." Jonathan Allan, economic development officer for the Vulcan Business Development Society, said Collier's family is still in the area and her grandson, Dave, has been informed about the find. "I found it to be just fascinating. I spoke with the grandson of the author of the letter and they had apparently just moved to Canada a year or two earlier. He did mention she went to school in both New Zealand and Australia before she was married." Allan said he was excited when Lacey reached out to them. "I was blown away with just the interesting elements of it considering it was written in 1919. And of course reading about the Winnipeg General Strike and also the view of the Americans." Collier also made mention of the entertainment available in the small town as winter descended. "Games on the ice is the order of the day out here now, 'Curling,' 'Hockey' and Skating." The letter has been offered to the family but Collier said it will be placed in the Vulcan museum.